Last Wednesday evening we opened the doors of our brand new Teaching Barn to promote the vision for the Sylva Wood School. We enjoyed showing our trustees, funders, collaborators and friends from industry around our well-equipped teaching venue and explaining future planned developments for the Wood Centre. Some of the creative businesses we host also opened up their workshops, highlighting the incredible community that has rapidly developed over the past three years – it was clear to see the potential for any students coming onto the site to learn from such a diverse range of experts. The feedback from the evening was overwhelmingly positive. 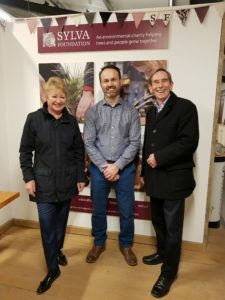 It was wonderful to see the furniture industry well-represented by Dids Macdonald and Tony Smart of the Furniture Makers Company, designer-makers Richard Williams and Philip Koomen, as well as representatives of heavyweights such as William Hands and Ercol. We look forward to further strengthening our relationship with the sector to teach and guide people into the industry. 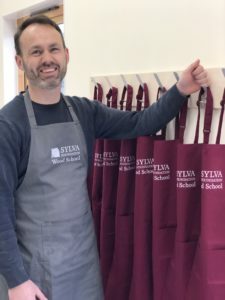 Joseph Bray, Head of Wood School, shared his thoughts on the future of education in the wood sector focussing on the opportunities to deliver excellence in education and business enterprise. “Schools have changed from woodwork to much broader D&T and over the past 10 years the decline in entries to GCSE has reduced by well over 50% The emphasis of these courses has significantly moved away from making! Colleges offering vocational furniture training can almost be counted on one hand and University level craft programmes have declined significantly some closing workshops and some closing all together. Often graduates are pushed out into the world with varying levels of support and guidance. “An exception to the rule is our close neighbour Rycotewood in Oxford. We hope to enhance our close relationship continuing to work closely with staff, students and graduates. Joseph is midway through an inspiring Churchill Fellowship, travelling to world-renowned institutions delivering furniture craft education in USA and Europe. He is investigating how they continue to support students to learn craft skills in light of the challenges within the education sector and how students are supported on graduation. This experience is especially helpful at this stage of the development of our Wood School. He is off to Europe in March and we look forward to hearing what he has learnt on his return. Sylva Foundation is very grateful to the following funders for their support in constructing and furnishing the Teaching Barn: Aspen Trust, D’Oyly Carte Charitable Trust, Oxfordshire LEADER, People’s Postcode Lottery, Shanly Foundation.